Indiana University wrestling sophomore, and 2012 JHS alum, Alonzo Shepherd will soon see a familiar face in the friendly confines of Bloomington, Ind. Gavin Jolley-Little, a 285-pound wrestler, committed to Indiana University last week, bringing the Red Devil athletics tally to four signed student-athletes for the 2013-14 season. 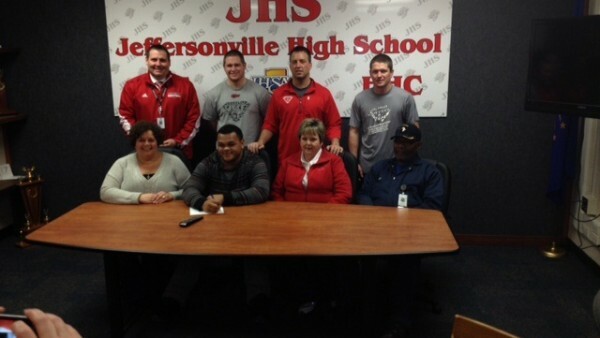 Jolley-Little did not take his signing, nor his senior year, lightly. Over the summer, Jolley-Little at-tended the FILA (International Wrestling Federation) Cadet Nationals, as well as the Future Junior Olym-pic Camp, competing against some of the best high school wrestlers in the country. The events hold tri-als for the men’s freestyle and Greco-Roman University World Teams. The extra practice and work comes after a stellar junior season for head coach Danny Struck. Last year, Jolley-Little dropped just six matches, compiling 46 wins in the process. This season, the 285-pounder is starting out unbelievably strong, unblemished at 25-0. Even despite his flawless 25-0 start to the season, Jolley-Little has enough decorations to make any Red Devil athlete blush. The senior is a five-time All-American, two-time National Champion and an IHSAA State Qualifier. He also claims two IHSAA Sectional championships, a Hoosier Hills Conference (HHC) championship, as well as a Regional championship. Jolley-Little will be in good hands once he reaches the Hoosier-land, as well. Indiana is currently ranked No. 23 in wrestling after an 8-2-1 start to the season.